The perfect pink patio plant. Very compact, yet incredibly floriferous! Produces more flowers, over a longer season, than any other variety! The perfect softest powder pink patio shrub, Lavatera 'Barnsley baby' has taken the huge flower power of it's vigorous cousins, and focussed it all on a much smaller and naturally compact form. It is very very easy to grow, very tough and robust in rain and shine, and in summer produces lovely candyfloss pink flower displays that shorter the plant, as the strings of buds open from bottom to top of each and every stem. Perfect in 20-30cm patio pots, simply keep watered and fed monthly, and cut back once a year before new growth starts - a very low maintenance but high reward plant indeed. Supplied as a pack of 3 plants in 9cm pots, well branched, 15-20cm tall, to plant out all year. Mallows can be slow to show signs of life in early spring, so you'll need a little more patience than normal before it returns to bud - don't worry it's a late riser! Before planting, prepare the soil by digging over and removing any weeds. Please note that plants will die back over the winter months, emerging from the soil again in the spring. 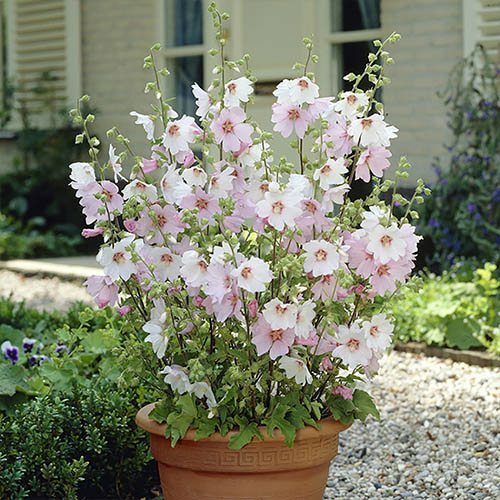 Your mallow will need regular water when first planted until established. After that, they fairly maintenace free. Feed plants regularly during the growing season with a general purpose feed such as our Blooming Fast soluable fertiliser. Pruning lavatera is best undertaken in spring when all risk of frost has passed and new buds are swelling. Prune all stems back to about 30cm (12in) above ground level.